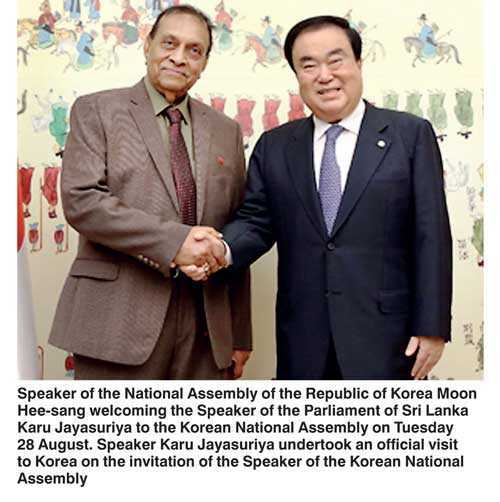 Speaker of the Parliament of Sri Lanka Karu Jayasuriya undertook an official visit to the Republic of Korea from 27-30 August on the invitation of the Speaker of the Korean National Assembly. The Speaker was accompanied on the visit by a cross-party group of Parliamentarians from Sri Lanka, comprising Social Welfare and Primary Industries Minister and Sri Lanka Parliament Sri Lanka-Korea Parliamentary Friendship Association Secretary, Daya Gamage; Members of Parliament Bandula Gunawardana, Vijitha Herath and Dayasiri Jayasekera, the latter holding the portfolio of Sri Lanka-Korea Parliamentary Friendship Association President; and Chief of Staff and Deputy Secretary General of Parliament Neil Iddawala. Speaker Jayasuriya, who was warmly received at the airport by the President of the Korea-Sri Lanka Parliamentary Friendship Group and Chairman of Strategy and Finance Committee in the Korean National Assembly Jung Sung-ho, had meetings with several high-level dignitaries of the Korean Government, including: the Speaker of the 20th National Assembly Moon Hee-sang; Korean Prime Minister Lee Nak-yon; Chief of National Security and Chairman of NSC Standing Committee Chung Eui-yong; Mayor of Seoul Metropolitan Government Park Won-soon; and President and members of the Korea-Sri Lanka Parliamentary Friendship Group. The Speaker and delegation were hosted to an official dinner by Speaker Moon Hee-sang at his official residence, with distinguished Members of the Korean National Assembly, including Chairman of the Foreign Affairs and Unification Committee Kang Seok-ho. The dinner also included an attractive cultural performance by Korean band Dubeonjjaedal (second moon), with an interpretation of a popular Sri Lankan song as well as Korean music. The Speaker and delegation were also hosted to a luncheon by President Jung Sung-ho and Members of the Korea-Sri Lanka Parliamentary Friendship Group. During high-level interactions with Korean interlocutors, including Speaker Moon and Prime Minister Lee, the two sides expressed satisfaction at the close friendship and cooperation existing between Sri Lanka and Korea, reinforced by the state visit of President Maithripala Sirisena last November to commemorate 40 years of diplomatic relations between the two countries. The two sides discussed the range of bilateral issues and agreed to further enhance relations through cooperation between Parliaments of the two countries and the two Parliamentary friendship groups, with exchange of visits including more high-level visits from the Korean side to Sri Lanka. Jayasuriya also recalled with appreciation the history of economic cooperation between Sri Lanka and Korea, which included the first public-private partnership in Sri Lanka in the footwear industry, which was a joint venture with two well-known Korean companies. The Speaker of Sri Lanka Parliament also extended invitations to Speaker Moon Hee-sang and Prime Minister Lee Nak-yon, as well as the Korea-Sri Lanka Parliamentary Friendship Group of the Korean National Assembly to visit Sri Lanka in the near future, which were warmly received. The Speaker also took time off his busy schedule to pay a visit to the site where the new Sri Lankan Buddhist Temple, Korea-Sri Lanka Maha Vihara, is to be constructed in Asan city, under the aegis of the Temple’s Chief incumbent the Most Venerable Dr. Thalgamuwe Dhammakitti Thero. A Korean red pine tree was planted by the Speaker in honour of his visit at a ceremony attended by Sri Lankan and Korean devotees. 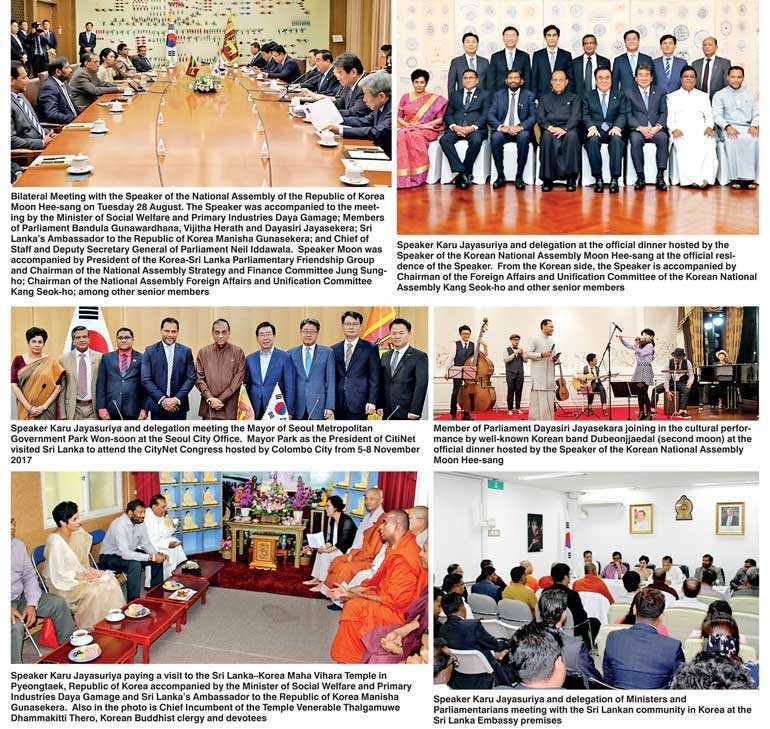 The Speaker and delegation of Ministers and MPs also participated in an informal interaction at the Sri Lankan Embassy in Seoul with a cross-section of the Sri Lankan community in Korea, including Buddhist clergy of Sri Lankan Temples located around Seoul, businesspersons, community representatives and members of the Sri Lankan Students’ Association in Korea. The productive interaction provided an opportunity to community members to discuss their proposals with regard to return support for Sri Lankan employees and support of Sri Lankan Government to SME start-up companies, among other issues. Jayasuriya also extended his deep appreciation to the Sri Lankan community in Korea for their valued contribution towards the economic development of Sri Lanka. The Speaker and delegation were supported on the visit by Sri Lanka’s Ambassador to the Republic of Korea Manisha Gunasekera and staff of the Sri Lanka Embassy in Seoul.